These days universal serial bus, more commonly known as USB, is being used for charging our mobile technology: cellular phones, tablets, smartwatches, MP3 players, and activity trackers. Mobile technology became commonplace with the adoption of cellular phones. At the outset, of this era of phone usage, each handset manufacturer had their own implementation to charge their products. This meant anytime you upgraded to a new phone, you would have a new charger and it wouldn't be compatible with another phone. USB was developed in the mid-1990s and was initially used to connect peripherals to a computer. Being developed as a standard, USB is compatible with any manufacturer. A USB charger comes in two parts: the cable and a wall charger. The charger plugs into a standard outlet and then you plug the cable into the charger. 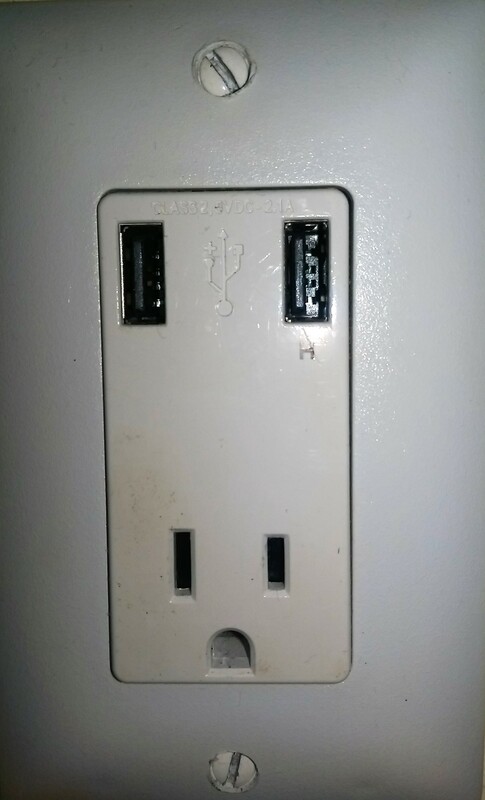 For convenience, companies have developed a new outlet that has USB outlets built in. These outlets are available with only USB ports, but the majority of them combine your standard outlet with USB ports. 3. Unscrew the outlet itself, from the electrical box (typically two screws). It should easily pull out from the box. 5. Attach the wires to the new outlet. Create a hook, in the wire, and wrap it around the appropriate screw. The wires should be color-coded. Black is the hot wire and carries the power from the circuit breaker to the outlet, the white, neutral wire carries the power back to the box, and the green wire connects to the ground. 6. Once the wires are secured, push the wires back into the electrical box and screw the new outlet into the box. 7. Turn the circuit breaker back on, test the outlet, and replace the faceplate. Advancements in USB are also allowing the power of bigger items such as alarm clocks, desktop fans, and humidifiers, so it doesn't appear USB is going anywhere soon. Upgrading your outlets is an easy project that will give you a convenient way to charge your technology.